See how my spice is too big for the bottom shelf and I have no room on the top shelf. I recently watched a As Seen On TV ad for the Spicy Shelf and thought what a GREAT idea! The Spicy Shelf is a plastic shelf system that is stackable so you don’t waste any cupboard space. 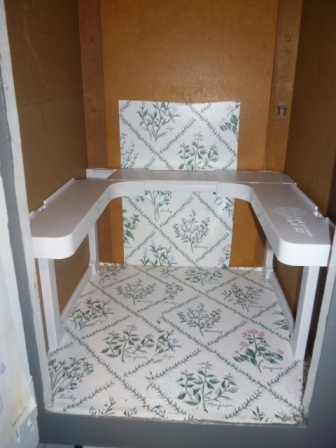 It can fit small cabinets (like mine) and come with extenders to make it fit nicely in larger cabinets or a pantry. The video does such a great job showing it’s possibilities I wanted to share it with you! 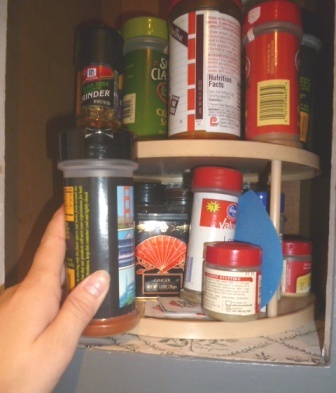 Now I want to share my personal experience with the Spicy Shelf and how I used it to organize my spice cupboard! As I mentioned above, my 3 previous attempts to keep my cabinet organized have failed. I got my Spicy Shelf, opened it up to see these pieces. 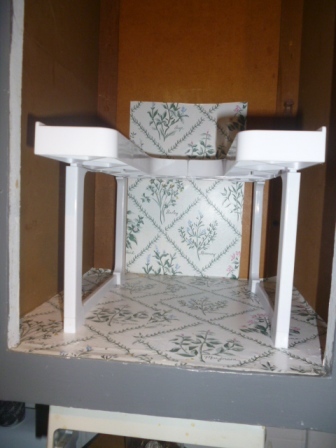 It included 3 different sizes of legs (so you can choose the height of your spicy shelf racks, support legs, 2 shelves, optional extender pieces and instructions on how to assemble the Spicy Shelf. It was very simple to put together via the locking system. My cabinet is VERY small so I didn’t use any of the extenders in fact I took off one of the “pre-attached” extenders to make it smaller and fit perfectly. 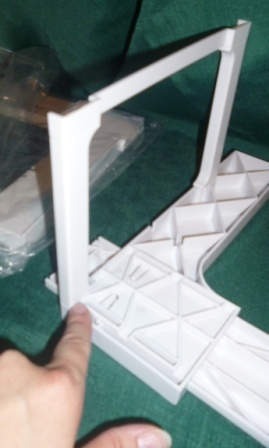 Then I attached the tallest set of legs and the set of leg supports by “locking” them into the proper space. 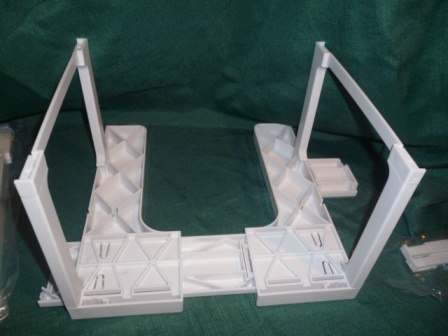 Then I did the other set of legs and supports on the other side. I slid the sides together to easily slip it into the cupboard. Then I gently slid the sides back out to line up with the edge of the cabinet for a snug fit. If your cupboard has pegs you can use those existing pegs to place the Spicy Shelf on it or use the optional legs like I used. Then the fun really began. I was able to organize by order of how often I use them, there wasn’t any wasted space, AND I can even fit my big spice containers on the top row! It is now clean and easy to find whatever I need without creating a giant mess! You can use the Spicy Shelf for other things than spices. It can organize nail polish, craft supplies, medicine and more! Once I finished putting this in, my husband came home and saw, he said, “WOW, that is VERY nice and organized” We are all impressed with the Spicy Shelf. 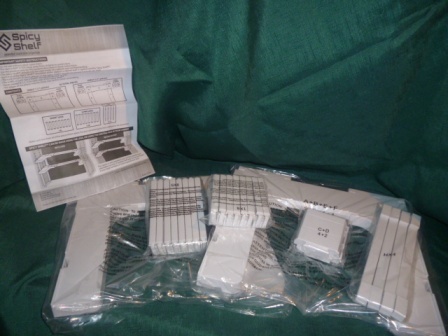 You can purchase 2 Spicy Shelves for $19.95 plus shipping and handling by going to their website HERE. What would you use the Spicy Shelf for? I’ve got a $5.00 Off Promo Code — SPICE5 – that is a 5 not a S.
Its giveaway time! One of you will win a spicy shelf! This giveaway will end on Thursday august 14th at 6 pm and is open to US residents. All you need to do is make a comment ON the blog post stating what you like about the spicy shelf….one comment per person….winner chosen randomly tomorrow night! Great idea…..I have a small pantry for my spices and they are stacked and I usually have to clear out quite a few before I find the one I’m looking for LOL. 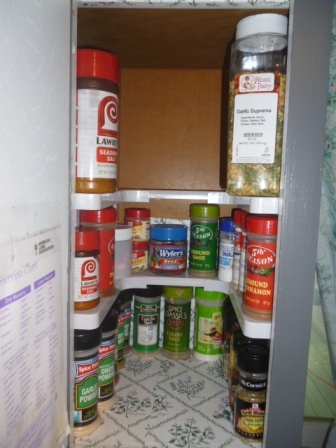 I love organizing my pantry shelves….thanks for sharing your review :). Disclosure: I was sent this product to review so I could gain an opinion to share with you. Regardless of this arrangement I was not required to provide a positive review. The opinions expressed above are my own. « Meet MiP The Self Balancing Toy Robot! Irina, Your cabinet looks great! I’m the inventor of Spicy Shelf. 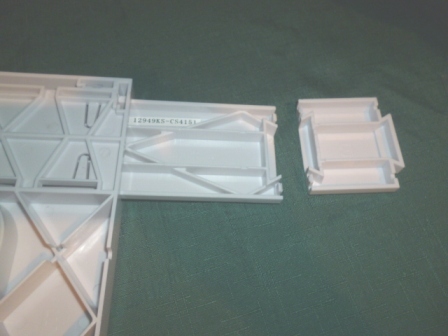 I noticed that you remove one of the 2″ pieces to make it fit your cabinet but then when you slid it out there is a void. You can easily add 1 “C” part (1″ piece) and possible even 1 “D” part (1/2″ piece) and you would have a complete level surface, no void. Also the back part of the shelf is wider so it fits the larger bottles great. Hope that helps. Thank so much for the review. Enjoy it! Thank you DeeDee! I will change that out! Thanks for the tip! I was going to order this – but your blog post shows a $5 promo code & using the link you provided & going through the ordering process it ends up being the same price as is offered on their website & it doesn’t offer any place to enter a promo code. I love that you can see each individual spice so you don’t have to go through them all just to find the one you need!! I like that the shelves are adjustable. I, too, have that rotating shelf thing, and mostly all of them are too big so they go to the top where most of them fall off while I’m rotating it trying to find a specific spice. I love that this spice shelf makes them all easy to see. My husband buys garlic salt way too often, forgetting that we already have some, haha! I think we have 3 in the cabinet right now. I’d love to be able to organize ours to where we could see what we’ve got! I love this!! I also have a hard time finding a good way to store my spices. This looks like exactly what I need. I also like the idea of using it for medicine. That would be handy to have so you can see all the vitamins and such without digging through the baskets I’m currently trying to organize them in. This is such a great idea!!!!!!! I really love this and would be very useful in my rv thanks! I would ❤ to win this!!! My spices are a mess, and this would help so much. I love that it is completely adjustable. This way if you move somewhere else with different cabinet spacing you can adjust it as needed. I also think it is really neat that it has shelves because tons of space in our spice cabinet is not used and stacking the spices on top of each other just isn’t going to happen with my husband doing a lot of the cooking in the evenings. This would be an amazing addition to my spice shelf!!! Thank you for the opportunity to enter!! I love how you can see each spice, better than digging through to find that 1 your looking for. I like how you can see the spices, that you use the most and how the cupboard look very clean now Thanks for the chance! I love that you can see all your spices easily and fit your big ones as well since that is one thing I struggle with myself! love this Idea and hope to get to try it. What a great idea! I like to buy the large jars of spices from my local Warehouse Club, but find that they make for a huge confusing mess in my spice cabinet. This unique invention would solve those issues! Love that it saves space! Would love to be able to see all my spices and know what I have! I love this!! I would be able to actually find the spice I need instead of going through every single one! My spice cabinet is in such a disarray because I have no organization to it. This would be a great help to me and make cooking so much easier for me. Just open the cabinet and see what spice you need get it and put it back, there ya go no more messy spice cabinet for me!! Wonderful thing to own for anyone who loves to cook, which by the way, I DO!! I like that it will free up a ton of space in my cabinets! I aLove that you can SEE everything!! I am lucky if I don’t get an avalanche of spices on my head when I open my spice cabinet. I NEED this! I like how easy it looks to use. I think it looks easier to find your spices and wow, that would work in my cabinet also! I love the way the Spicy Shelf keeps everything neat and where you can see it all!!! My spice shelf is a disaster!! It starts off good then every time someone gets in it, it gets messed up again. Can’t find stuff, cant see the names on the labels, just an absolute mess!!! This would be such a great help. Thanks for the chance!! This is awesome it makes it easy to see all my spices and I sure to have a lot! I love that it even fits bigger spices like seasoning salt! This would help so much in clearing up the clutter! I love this set up! I have a small kitchen with little space. I don’t use many spices I have because I have to take them all out to find what I want. This is the best idea yet! It would be great to win this product and make all my spices available to me when I cook. Thank you for sharing this! I love how it’s so organized that you can see all your spices without have to dig around and take out a ton or spice bottles trying to find the one/ones you’re looking for causing all kinds of frustration. oh my, this looks like such a simple solution that I’m made I haven’t thought of it or seen it before! we have really narrow but deep shelves so storage is a huge pain – this is perfect for our cabinets! My cabinet is a disaster..seems easy to assemble..it would motivate me to organize and purge!..Oh I hope I win this!!!! This would be wonderful to have. My spice cabinet is a wreck!! I like the fact that you can actually see the names of the spices, mine I have to take all out of the cupboard to find the one I am looking for, lol. This would make life so mush easier!! Thank you for the giveaway and great details & pics of the product. I like that it will fit in any size cabinet. I absolutely love how you can find everything almost instantly and you have choices about the height. I cant find anything in mine!!!! I love that you can see everything at a glance and that it is adjustable. I have different sizes of bottles and trying to find something that fits them all I haven’t been able to find until now. Very cool. Thanks for sharing. I love that the shelf is adjustable and can hold such a large number of spices! I could really use this! 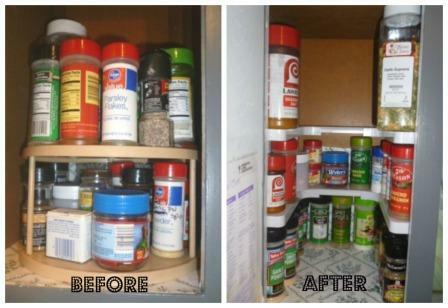 I love that ALL of your spices are visible and you don’t have to go digging through the cabinet to find what you need! Just Awesome!! I so need this! Thanks for the chance!!! I like the thought for spice but it says you can use the Spicy Shelf for other things than spices. It can organize nail polish, craft supplies, medicine and more. Oh man….what a great idea! I love that you can actually see what you have regardless of the size. I need this for sure. I love this idea. It makes finding what your looking for so much easier – and you have more room to boot. This would work perfectly in my kitchen. I like the convenience of being able to find the spices you want without having to search for them. I like how easy it is to put together. Would love one! I love how much space there is and everything is visible. There is even room in the center for my tall bottles of olive oil and sherry. I love that the center is open so you can see everything.You just reach in and select without spinning and searching. Oh my gosh! You can actually see what spices you have! I like how it solves my storage needs, makes my spices look neater in the cupboards. I really like that you can see all the spices names! This looks awesome. My kitchen is very tiny and I love to cook so this would be perfect for me so I don’t have to get rid of my beloved spice collection. I like that you can make it bigger or smaller depending on your siutatioN! I love the visibility of each spice. You don’t have to move all the ones in front or under to find what you need in the back. Very clever idea. I sooooo could use this! I actually have an entire cabinet dedicated to my spices and my organizing goes as far as little wire baskets to hold them so I can pull out a basket and look for the spice jar, lol. Very cool, tyvm!!! 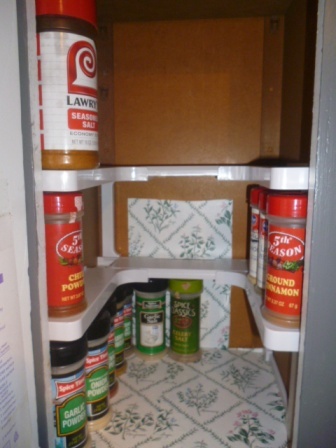 I love that the Spicy Shelf is adjustable to fit all size of cabinets as well as the height of the shelf. My cabinet is the same size as yours and I am forever having to take everything out to find the one or two I need which are always at the back of the cabinet and the “bottom” of the stack of spices I have at the back. I would love my cabinet to be this neat and organized! I love how it organizes the cupboard !!! I love the ease of locating the spices and the feeling of organization that the spicy shelf would give me. It could be used in a medicine cabinet, with arts supplies, nail polish, pretty much anything that needs organization. I personally would bask in the feeling of neatness in an almost zen like way and many others could benefit from this household wonder. I need this shelf! My cupboard is tiny, and nothing else has ever worked. I think the Spicy Shelf would be perfect! Hoping to win and try it out! What a great idea! At my previous home I had a huge wooden spice rack where I could clearly see all my spices arranged alphabetically & hanging on the wall, which was wonderful. But my new home’s kitchen has a much more upscale/modern look & having spices on display wouldn’t fit in so I’ve been using two-tiered rotating spice racks similar to yours (I actually have two of them in my cupboards). And to get all my spices in them I have to have some stored/hidden in the center & even though I try to keep them alphabetized/organized it’s not so simple to find things when they aren’t arranged all in a row. These racks look like they’d be perfect to keep my spice cabinets organized! This is genius! I have my spices just randomly located in a cabinet so I would love some organization added to them! I like that it keeps you from having to reach around all of the other spices and knocking them down while trying to get the spices that you want. I also purchased my spicy shelf from bed bath & beyond. I absolutely love love this system. I purchased all organic spices that come in square glass jars. The only problem I had was that the glass jars tend to slide off the shelf because they glide easier on the plastic. So my solution to this minor problem was to use non skid shelf mats. I went to home depot and purchased a roll for under $5.00, cut strips of it , glued the corners down. It worked like a charm. Thank you for the great before and after pics.